Providing you the best range of digital usb microscope with effective & timely delivery. Digital USB Microscope is a creative device that it is an amazing and easy to use handheld digital microscope with USB interface. It broke the conception of a traditional microscope, it realised these functions: measurement, save, copy, transfer image and video which are difficult for a traditional microscope. It is a small, easy to operate and portable fun. 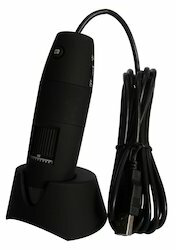 Looking for “Digital USB Microscope”?